I always get so excited when I have the privilege of working with the local schools! Yesterday, at Dubray Books Galway Branch, it was our absolute pleasure to host a mini-launch of the wonderful book, Ruadan, Riona and the Luadog Chalice. The students from Scoil Chatriona Senior in Renmore descended on the shop at 10am to present the first launch of this book, which was written in a collaboration of students from twelve Galway schools with the assistance of the Galway City Partnership and the School Completion Programme. It is a wonderful adventure read that sees our heroes travel across the globe, visiting every port that the Volvo Ocean Race visits, beginning and ending in Galway. (And the book is available just in time for the Volvo Ocean Race Festival, which is taking place in Galway 30 June through 8 July!) A truly exciting adventure story, as was the writing of the book, according to our young authors! Scoil Chatriona Senior students are responsible for the writing of chapter eight; Miami: The Maze. Congratulations to 'The Girl Who Circumnavigated Fairyland..."
The Girl Who Circumnavigated Fairyland in a Ship of Her Own Making continues to go from strength to strength as it makes it's way across the published world. The 2012 Locus Award Winners were announced in the 16th of June; and this wonderful, incredible, deeply enjoyable book has taken the first place award in the Young Adult category! I'm sure, by this time, you all get the point that this has become one of my favourite books ever. 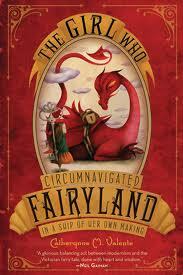 Again, I will say, if you only read one book this summer, read The Girl Who Circumnavigated Fairyland in a Ship of Her Own Making by Catherynne M. Valente. Congratulations, Catherynne... and my personal heartfelt thanks for writing such an amazing story. Urban Knitting Hits Eyre Square! Hats off to Scoil San Phroinsais (Tirellan School)/Tirellan Urban Knit, who have certainly brightened my day.... week.... month! 134 children and their families, 300 balls of wool, 3,796,520 stitches and 2086 patches have created a wonderful, wonderful, wonderful Urban Knitting project that now covers the iconic sails sculpture at the top of Eyre Square!What a great thing for a school to teach... really thinking outside the box! And all (as it says on their info) "to make you smile!" I haven't stopped all day! Thank you! Just to let everybody know... there will be a mini-launch at Dubray Books' Galway Branch on Monday, 25 June 10am for the book 'Ruadan, Riona and the Luadog Chalice', written by the collective of children from Galway City Schools. Let's all get behind them for this marvellous event and a truly gripping read. Well done to you all! Here we are at the end of the school year! But before Galway itself gets caught up in all the excitement of summer with it's festivals and parties, there is something you really do need to know about. RUADAN, RIONA and the LUADOG CHALICE. "A story of a long lost Chalice known as the Luadog Chalice, captures the imagination of Grandad and his grandson Ruadan. Armed with a map, compass and his Grandad's journal - assisted by his sister Riona, they find the missing Chalice. Their amazing, exciting and sometimes terrifying adventure starts in Galway and has them magically transported to distant lands following the path of the Volvo Ocean Race. The secret of their safe return home lies in protecting the precious Chalice." Diarmaid O'Riordan (acting as coordinator for the project) pointed out the emphasis on this project was to get the students reading... to get them excited about reading, and to help them develop increased literacy skills. That aside, the book itself is a wonderful read! The story is well thought-out, well expressed and how on earth you accomplish that between twelve schools worth of students working on a project is just a miracle. It is a exciting adventure that you'll get caught up in and won't want to put down. Well done to all involved. You should be crowing with pride! 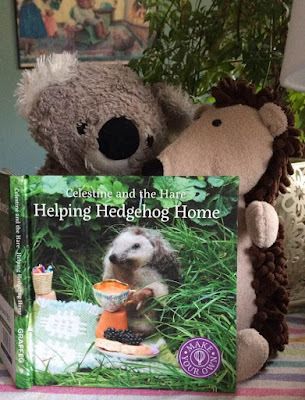 Please get behind this wonderful book. All profits from its' sale go to charity... and it's a project I think we should want more of in the future. 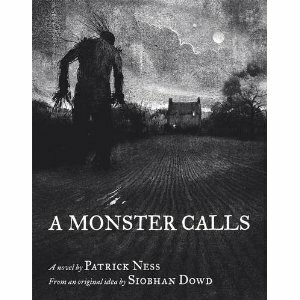 Big and hearty congratulations to Patrick Ness and illustrator Jim Kay!!! 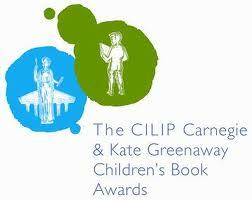 A Monster Calls has picked up both the prestigious CILIP Carnegie Medal and the Kate Greenaway Medal. I couldn't be more pleased for them both. This is a truly wondrous and magnificent book that deserves all the success and accolades it has received. Well done to you both! I'm absolutely certain that the spirit of Siobhan Dowd is celebrating with you. Great news for all you Fairyland fans ( that is The Girl Who Circumnavigated Fairyland in a Ship of Her Own Making by Catherynne Valente... and if you haven't read it yet, oh, please, please do!!!) 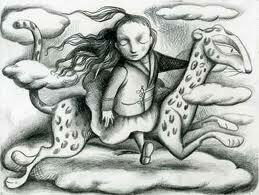 There is now a wonderful new website 'Catherynne M. Valente's Fairyland'. Here you will find all things Fairyland; Catherynne's books, the Dramatis Personae, Thoughts on Fairyland, Fairyland Quizzes.... all the essentials for fans of this wonderful, wonderful book! And once you read it, trust me, you will be a fan for life. So here's the link. Check it out for yourself! I was just up at the International Quilt Festival at NUI Galway... fabulous, by the way... at any rate, in case you're thinking "What's this got to do with childrens' books?"... look what I found!!!! Just a quick shout to let you know (if you haven't found it yet), I've got a review of the wonderful historical, apocalyptic novel All Fall Down by Sally Nicholls on the What ARE You Reading page of this blog. And here's the link for the more complete review of the same book that's just gone up on The Bookbag. Thanks to Sue et al... you are always very fast! Just a quick entry to remind you of two very important Children's Literature awards that are coming up soon. The awards will be presented on July 5th at a ceremony in London. The winning author stands to receive a cheque for £1000.00 and both author and editor receive a beautiful, handcrafted, silver-inlaid box. Quite an impressive list this year! Good luck to you all. And a real quick reminder that the CILIP Carnegie and Kate Greenaway Medals are due to be presented on the 14th of June. (For the shortlist, please see my early entry on this award.) Very exciting! I'll be sure to let you know as soon as I do. 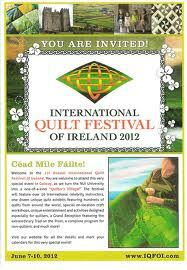 The first annual International Quilt Festival of Ireland is only 4 days away. The campus of NUI Galway is being transformed as we speak into a specially laid-out "Quilters Village", redesigning classrooms, buildings and restaurants into a unique setting for this very special event. There will truly be something for the entire family! And with the kids out of school (soon for the primary school kids), it's a brilliant way to kick the summer off. Here's part of the letter from Jim West, managing director of the event, outlining some of what will be happening on June 8 through 10th. "As you stroll around the village you will find Fat Quarter’s Chocolate Shop, the Wicked Thimble Pub, the Town Hall, our School House, the Round Robin Restaurant, a Craft Center, Celtic Tea Room a high-end restaurant called Stash. We have even commissioned a theatrical set designer to create a façade that replicates that of an old Irish village from the 1600’s. This area is known as our Quilter’s Square. As you walk around the village, you are sure to run into our very charming mayor of the Quilter’s Village, the town crier announcing activities and events taking place throughout the day, and even Molly Malone as she walks around pushing her cart and selling fat quarters! We have also decided we didn’t want to have a very congested vendors area where people are bumping into each other because it is so crowded. Instead, we have invited 50 specially chosen companies who will be offering their goods and services to you. There will also be a special area in the village called our “Quilter’s Market,” with two dozen local craft vendors selling specialized craft items. And we realized a quilt festival wouldn’t be a quilt festival without quilts! You will find fourteen uniquely designed quilt exhibits offering hundreds of beautifully designed quilts. You’ll enter each exhibit and all of your senses will be activated. These exhibits are more of an “experience” instead of an observation. We felt it was essential that we designed our exhibits with an outside of the box approach instead of just hanging quilts on racks and having people come into a room and view them. So with our exhibits, you will actually be part of a theatrical presentation- some of them include actors, a set, music and even different aromas! All of your senses will be activated and your soul will be touched as you stroll from exhibit to exhibit. I am very proud to include an extraordinary line up of celebrity teachers from all over the world. All of these teachers, their class projects and the times of their classes are posted on the festival website, so be sure you secure your space if you want to enjoy a class with one of them. I believe most classes will be sold out before the actual festival weekend! With our festival here in Ireland, we are introducing two very special elements that the international quilting community has never seen. The first is a complete hands-on crafts program, including of course, traditional Irish crafts, from lacemaking and painting to feltmaking and pottery. There’s even an overnight trip to the Aran Islands for a special knitting workshop! Second, we are offering a non-quilter’s activity program, so those who are not interested in the quilt classes can enjoy some very special activities, from fishing and golf to cycling and pub crawls."